You've given me an idea with your kH levels, I've been running at 1.5 and resulting in a about 43ppm of K. So bringing just that down to 1kH will give me a 7 point drop in K levels to 36.14. However if I then drop NO3 dosing from 30 to 20 NO3, that gets me down a bit more to 29K. Once my pre measured RO kh/gh mix is done in 2 week batches I'll try the change to a lower K and NO3 level. That sounds like a good plan to try. I went the extra step using MgNO3 for Nitrate, but don't know if it's necessary. I just went all in. Looking forward to seeing how it goes for you. Should be interesting. chayos00 and Ken Keating1 like this. Yeah, I'm going to go that other lower route once I need to order more of any ferts. Greggz and Ken Keating1 like this. Last edited by chayos00; 04-09-2019 at 05:43 AM. Here's a pic of the L. Atlantis for you @Maryland Guppy. I tried but couldn't really capture the subtle details. Looks more monochromatic in pics, but looks more painted with colors in person. And this is not near the surface yet, so I am guessing will change as it grows. Man, that looks darn good, Linn must of sent me the mini version! Greggz, burr740, Maryland Guppy and 1 others like this. Saturday is maintenance day. Was out of town most of the week, so things were left to grow wild. A few groupings have become too thick, and it was time for a serious trim. Here's things after a week of untouched growth. I've mentioned growth is slower with the new dosing, but make no mistake, things are still growing. The Limno Aromatica Mini is a thick mass and starting to grow into the Macranda. Time to pull it all and thin it out. It's a pretty good size bunch once you get it out of the tank. While it's out, a good time to vac the area. When it becomes a thick bush, it traps a lot of debris. So I go at the area pretty hard when it's out of the tank. 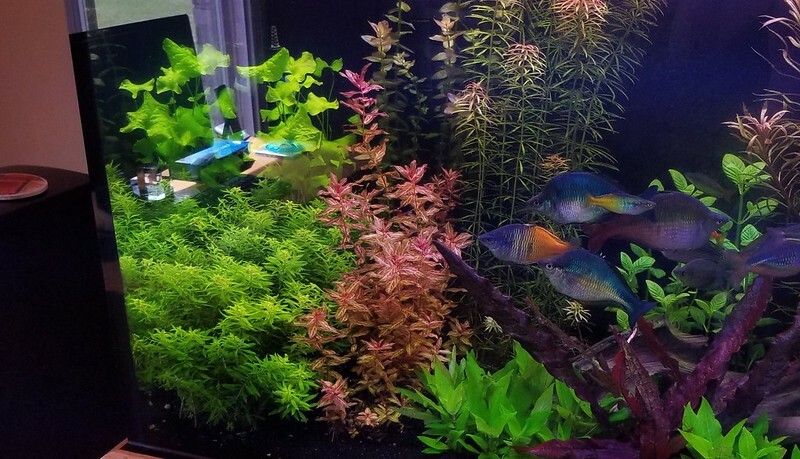 I also pulled and trimmed back the Macranda Variegated, Bacopa Colorata, Pantanal, Pogo Kimberly, Macranda Butterfly, and maybe a few more too. Here is the Pogo K......when it gets big those stalks get thick! Here's the battle station about half way through. About a gallon of plant mass removed, and as you can see, it can get a bit messy. Pulling lots of groupings stirs up a lot of debris into the water column, hence a serious sized water change to remove as much as I can. The drift wood comes out every week and gets a preventative spray of a Metricide/Hydrogen Peroxide mix, along with all the visible equipment. About 2 1/2 hours later and the tank has been tamed. Restored some space between the species and removed a LOT of mass. Sometimes you just have to beat things back hard for the longer term well being of everything. That day was today, and should make the next few maintenance days a bit easier. Hendy8888, aqua-botanicae, rzn7z7 and 11 others like this. This is why my thoughts moved to a "street" of this species. It can also remain untouched for quite some time. Limno Aromatica Mini is one of the least fussy plants I have ever kept. You can't stop it from growing and branching. Even in a street, over time it will spread and start growing into whatever is next to it. But it does take time. No weekly maintenance like some fast growing stems. But once it gets really thick, I have found it's best to just beat it down and remove about 1/2 the mass. Then it's good for probably a couple of months before it gets out of control again. burr740, Maryland Guppy and tredford like this. Kinda amazing how much time you can spend on a given Saturday trimming plants and doing just general maintenance. I "try" to do trimming sometime on Saturday and water changes on Sunday but that does not always happen. I also "intend" on doing water changes on the 75g, 40g, 20g, 5g & 5g.... yeah, that doesn't always happen on Sunday, lol. That was an impressive jungle you had there before the trim. Your 8th pic above is a very good example of what "maintenance" day looks like - most rookies to planted tanks think there is very little work to be done - LOL. Will try to get some pics up tomorrow of my hot mess - should be interesting, I have a new phone. Wonder where the "antique" filter is? Greggz, vvDO, Maryland Guppy and 1 others like this. Greggz and burr740 like this. It's very, very fast. Close to an inch a day. It gets pulled and trimmed every week. If I didn't love the look of it so much, it would be gone. Looking forward to seeing how it does in your tank.